Get your spy instincts up as we cover some of the really cool, and useful ways to smartly spy on your competitor blogs success strategy and yet get away with it like a pro. These tricks and tips are legitimate, perfectly balanced and do not necessarily cost you a penny. Grab them today before someone else, who might actually become your competitor tomorrow, does. Have you ever wondered how great blogs are born? If you simply think they have a great content marketing strategy, you are not wrong. If you think they have great ideas for sustaining the hype around them, you are not out of the mark. If you think they have great customer relation management principles, you hit the stone. But is that all about their winning strategy? Great blogs are born because of all the principles mentioned above. But on the top of that, they have great techniques to spy on their competitor blog’s success strategy. Taking a close watch on what their competitors do, and then replicating those strategies for their own benefit has always been the core of business development component for a long time. Companies and individuals who operate in the online ecosystem are also using the trick. Every blog is once new, they scale up using a slow, steady, controlled and sustained growth path. While upping their standard, they gradually commit mistakes and learn from them. 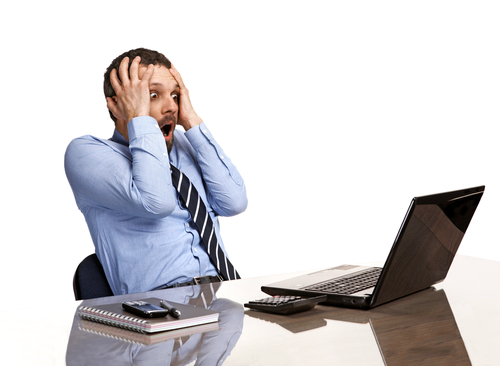 Learning from the mistakes of their competitors is also important for the beneficial online presence for blogs. Here are top 5 tactics you can use to legitimately spy on your competitor blogs’ success strategy and get away with your spoofing act without any trace. 1.2 2. Which types of content are gaining on the ground? Some blogs maintain a very clever strategy, some simply walk the often traveled manner. 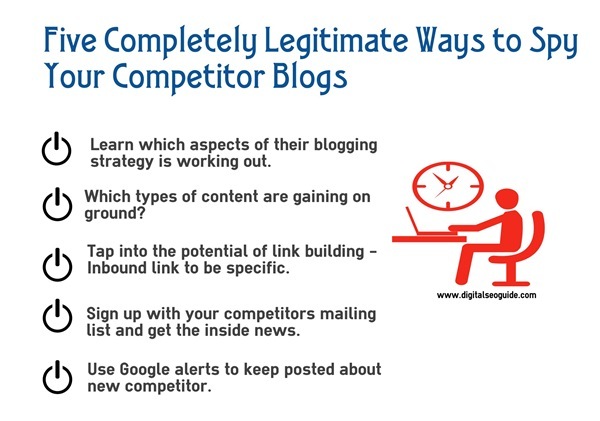 To start off with your spying act, you need to understand your competitor blog’s strategy. The core idea is to understand how effective your competitors are at blogging and how can you build on their success and exploit their weaknesses. There are a few important things that you can do to investigate the blogging strategy of your competitor. How are they ranking well for their competitive search terms? Which types are they publishing? Are they publishing tutorials, EBooks, product-specific information, videos etc? Are there any obvious gaps in their content publishing strategy? 2. Which types of content are gaining on the ground? Comments and shares are very important components, But it is also an indication which types and forms and specialization of content actually engage, inspire and motivate your targeted audience. The topics that motivate and raise social discussions are importantly vital. Learning what actually worked for your competitor and what does not work for them is an important idea to improve. One of the great ways to improve your website performance and blog health is to reach out to the competitors’ social circles. There are so many improved ways to tap into the potentialities of the most active audience of your competitors. One of the great ways is to reach out to their profiles, following them, retweeting their tweets, and making a list specifically for hosting them to your profile. When you have clustered variety and set of improved audience profiles who actually are helpful for your brand, your effort to market your product/service reduces. When you sign up for your competitors’ mailing list, you get a chance to peep inside their news and customer centricity ideas. Whenever they post something, you keep informed. You get to know the ideas, emails, and tactics they use to keep customers. How they write to customers, how they reply to their queries, how they move the discussion to the new level – these customer centricity programs are usually beneficial and if you are an insider, you get the report. You can use Google alerts or other alert systems to know who is doing what and who is up for a competition. You can enter some strategic keywords on the alert database so that whenever anyone posts something around those keywords, you are the first person to know them – of course, once they are indexed. These are some of the improved variety of facts and ideas to spy on your competition. The better detectives are better search marketers. If you need to scale up and that if you need to improve, it is very important that you have an understanding of your competition. But do your spying smartly, do not ever indulge in anything that is bad and against the law.